Follow this recipe and close your eyes when you take your first bite. Hard to believe its cauliflower. Cut cauliflower into florets and steam for 5 minutes until just tender. Cool. Combine buttermilk, COLMAN'S Dijon Mustard, sugar and half the KNORR Mixed Chilli Puree. Reserve remaining chilli puree. Fold the mixture through the cauliflower. Refrigerate for about 3 hours to infuse the flavours. Drain cauliflower and add flour to the liquid. Whisk to a batter consistency. Dust the cauliflower in additional flour, dip in chilli batter then coat again in flour. 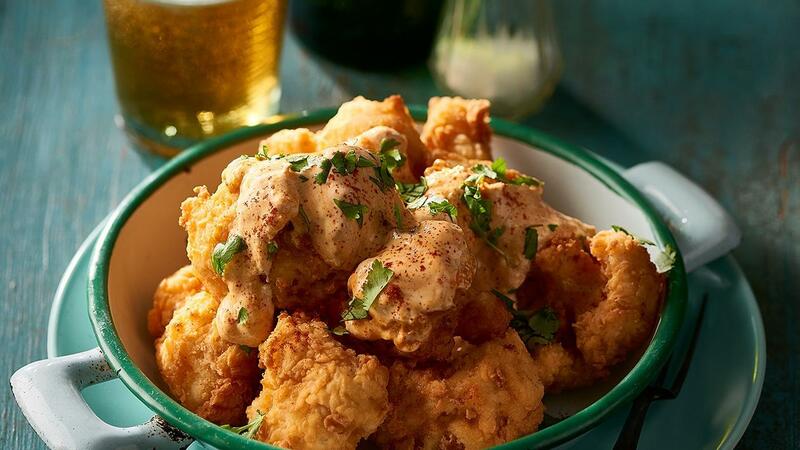 Combine the remaining KNORR Mixed Chilli Puree and sour cream and serve as a dipping sauce with the cauliflower. Garnish with chopped coriander.